Stone Arch Bridge is one of the historic characters of Minneapolis. This beautiful structure crosses over the Mississippi and for more than a century is one of the places in town where you can see the most beautiful scenery. Stone Arch Bridge is one of the biggest attractions in Minneapolis mostly because of its incredible architecture which consists of dozens of beautiful arches. Designed as a commercial railroad bridge, Stone Arch Bridge is today one of the most pleasant pedestrian and bicycle areas in Minneapolis. 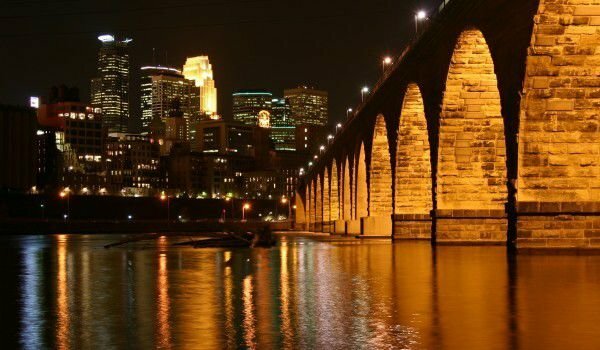 Many believe Stone Arch Bridge is on the best symbols for the historical importance of waterfalls, rivers and watersheds in general, which are abundant in Minneapolis and which have played an important role in the development of the city for decades. Stone Arch Bridge crosses over the Mississippi River, just before the beautiful Saint Anthony Falls, which is located in central Minneapolis. Stone Arch Bridge is the work of tycoon James J. Hill, who decided to build a bridge over the Mississippi to provoke an increase in the flow of people and give a powerful impetus to trade in the town of Mississippi. As a working rail bridge, Stone Arch Bridge served until 1965. Today the bridge is considered one of the historic architectural landmarks of Minneapolis and is included in the National Register of Historic Places in the U.S. in 1971. Stone Arch Bridge appears there as part of the historic district of Saint Anthony Falls. The construction of the beautiful railway construction contractor cost Hill a record 650, 000 dollars. Originally he had a plan to build a much smaller and cheaper bridge, but he was warned that such a "lifeless" structure was not suitable for the site and that it may collaps. Most engineers at that time were skeptical to the fact that the lining of Stone Arch Bridge wwould withstand the pressure of vibrations and gravity of the passing trains. The solid granite limestone from which the bridge was constructed, however, proved to be more stable. Today 22 beautiful arches of the stone arches adorn the bridge in Mississippi. They are complemented by another metal arch. Over the years the structure of the Stone Arch Bridge was restored several times. In 1994 it was decided to allocate 2.8 million dollars for the reconstruction of the bridge and make it an enjoyable sport and recreation spot. After this repair, Stone Arch Bridge has had new railings, flooring and lighting. Today the bridge is one of the favorite places for residents to walk, look at the beautiful Saint Anthony Falls, or biking.